In a medium sized bowl, mix together sugars, cinnamon, and salt. Set aside. In another medium sized bowl, whisk the egg white and vanilla until it’s a little frothy. Add almonds. Make sure the almonds are thoroughly coated in the egg white mixture. Add cinnamon mixture to the almonds and toss until coated. Thoroughly spray with the stoneware of your crock pot with non-stick cooking spray and add the mixture of almonds and sugars. You have to stir really well, especially as it gets later in the cooking process. Line a baking sheet with parchment and spread the almonds flat to cool. 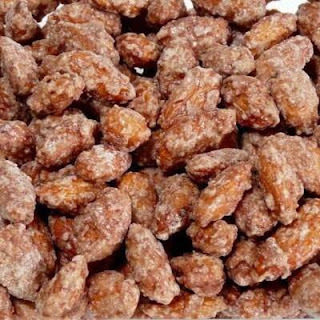 The almonds will be sticky at this point, so make sure you separate them a little and have no large mounds.